Mountains 101 is the U of A’s latest classroom-to-MOOC production. 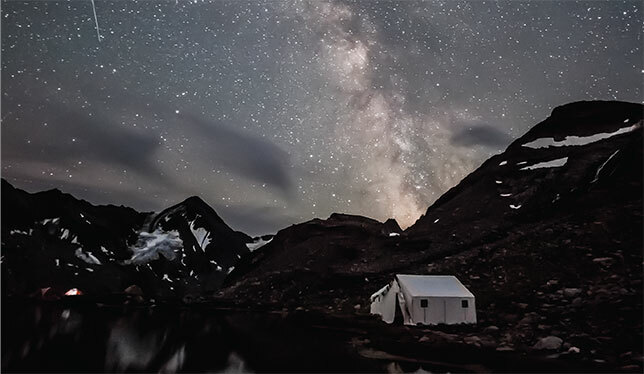 Whether a student in the Yukon, an academic in the Netherlands, or a high school teacher in British Columbia, the University of Alberta has made it so that anyone can learn about the science and majesty of the mountains through their screens. Mountains 101 is the latest massive open online course, or MOOC, created by U of A. A mountaineering camp in the Purcell Mountains near Radium, British Columbia, makes an appearance in Mountains 101. Photo by Zoltan Kenwell. David Hik, a biology professor, has taught the course in the classroom for close to four years. He found the challenge of restructuring it as a MOOC and creating new content gave him new insight into his course materials. “We needed to go through some iterations of how to prepare the material, write a script, get in to the studio to integrate the assets and visuals, and then rip it apart and try it again,” says Dr. Hik. Mountains 101 is hosted on Coursera, an international MOOC platform, and covers a wide swath of subjects: from the geological origins of mountains and their cultural significance, to the science of snow. Dr. Hik and his co-instructor Zac Robinson, an assistant professor of physical education, knew they didn’t want to just be on screen the entire time. “We came up with the idea of cameos,” says Dr. Hik. The course integrates appearances from mountain guides, land-use specialists and parks managers, among others. Some of these stem from a partnership with Parks Canada, which has included the MOOC in its 150th anniversary celebrations. It features documentary-style production, mapping tools and tech tips. It also uses tools developed to overcome the obstacle every online course faces: creating an interactive, classroom-like experience. Onlea is a non-profit MOOC production company that was spun-off from the U of A in 2014. With expertise in user experience design, video game development and education, producers work with instructors like Dr. Hik to move courses to the web.